Within minutes your web site listings can be top of the most popular search engines including Google, Yahoo and MSN (if you are willing to pay for it). This book explains how adword marketing programs work, ways to select and create effective keyword ads and how to measure keyword marketing performance. 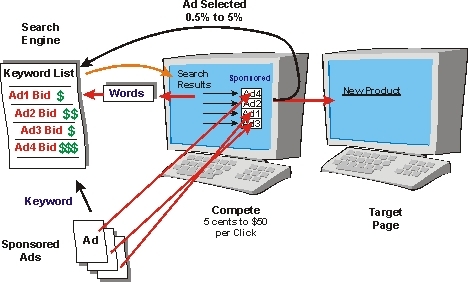 This figure shows the basic keyword advertising process. In this example, four companies have submitted ads to a search engines that match a keyword. When an Internet user enters a search word into the search engine, the search engine provides the user with a list of URLs found along with a list of sponsored ads. The sponsored ad presentation (impressions) is organized with the highest bid on top and ads with lower bids positioned lower on the screen. While you can get listed in the search engines within minutes, it takes skill and effort to cost effectively run Adword campaigns. Discover how to use keyword selection and management tools to find successful and cost effective keywords to you. Learn about keyword matching options (exact, phrase, and context) and how using them affects your success and marketing costs. Adword marketing options such as keyword selection options and inclusion of ads on content partner sites is described along with how to take advantage of these options without rapidly depleting your marketing funds. You will learn how to measure your Adword marketing performance including how to determine the cost per conversion. Highly effective adword marketing campaigns precisely match (target) ads to specific keywords. This can require the selection of thousands of keywords and the creation and management of hundreds of ads. You will learn how to use adword management tools to increase your effectiveness while reducing the amount of time it takes to manage your adword campaigns.